Up early. Coffee on the terrace with a view of the Picos de Europa mountains. Piercing blue summer skies, the barest wisp of cloud, and a sun that is already warm on the skin. Perfect summer walking weather in northern Spain. Apparently not. Jim, the hotel owner – who has promised to drive us to the trailhead – will not be moved on the matter. “You don’t want to go today”, says Jim. We do Jim, we really do. We’ve travelled all this way to go walking on a day like today – to follow the snaking Cares Gorge, high above a frothing river, basking in a sun that will beat down on our white English and Irish necks. That, also apparently, is the problem. “It’s going to be scorching today”, says Jim. “Thirty degrees, which means almost forty in the canyon. There’s no shade. Plus everyone will go today. It will be really crowded. Trust me, you don’t want to go today”. Instead, Jim sends us on a shaded valley walk, and we sit later on a cool, white-painted terrace and drink chilled wine over a long lunch. Next day. Another perfect start. As the sun heats the wispy grass under our bare feet, we pad around the hotel garden looking for Jim. We’re ready Jim, we are. Day-packs good to go, water bottles filled. English and Irish necks slathered in Factor 50. “It’s going to cloud over and rain tomorrow”, says Jim. “I’ll take you up to the trailhead then”. Are you sure about that Jim? Doesn’t that sound just the tiniest bit mad? Is what you’re saying, ignore the beautiful sun and wait for the terrible weather before you go walking on one of Europe’s most spectacular hikes? Would that be the gist of it Jim? “It’s not going to rain much. And it will be a lot cooler and less crowded. Trust me”. All right Jim, we will, seeing as you’re the one with the car. What shall we do today instead, in this lovely weather? “Take the bus down to the coast”, says Jim. “Have lunch. Drink wine. It won’t be so crowded there today. They’ll all be up here, walking the Cares Gorge. The mad fools”. We’re reserving judgement on who’s mad and who isn’t right now, thank you very much Jim. But we have the lunch and drink the wine, and sit in the hotel later that evening as parched, sunburned hikers stagger back in after seven long hours on the high, exposed Cares Gorge trail. “Great day!” says Jim the next morning. It’s grey and overcast, with roiling clouds obscuring the highest peaks and a few drops of rain falling into our morning cup of coffee. “Get your packs” says Jim. “We’re off” says Jim, as he swings the car out of the gate. Is it just us then Jim? No one else fancied a walk in the grey, cloud, rainy mountains? “Just you”, says Jim happily. We know, we say. Trust you. “That’s right!”, says Jim. “The rain will stop. The clouds will part. I’ve walked these mountains for years. This is your best day to walk the Cares Gorge”. We wave Jim goodbye at Poncebos and take to the trail under leaden skies. It’s twelve kilometres to the village of Caín and twelve kilometres back along the same path, a precarious rock-cut route surrounded by 2,000-metre-high mountains. Hydro-electric workers cut the path in the 1940s and 1950s, through tunnels and channels, round ragged rock stacks and over narrow stone bridges, with sheer thousand-metre drops below. There are few settings as majestic and unsettling as this. Heights need to be liked. Thousands of visitors walk the route each year; hundreds and hundreds in each direction every day in summer, queuing at pinch points, waiting at tight corners, an endless litany of hellos, holas and bonjours as hikers swish shoulders as they pass by. Only, not today. There are other walkers but no endless crowds – plenty to space to contemplate our insignificance under soaring rock walls. The rain peters out. The clouds part. The water far below sparkles in shafts of sunlight, and the temperature – dampened by the morning weather – remains reasonable. We say hello, hola, bonjour to just a few people, and otherwise walk largely in silence on this remarkable journey into the heart of the Picos. At the halfway stage we have lunch on a shaded restaurant terrace, and then retrace our steps, back along the magnificent Cares Gorge, back towards Jim, in whom we trust. It was Jim, it really was. You, us, circle of trust Jim, circle of trust. 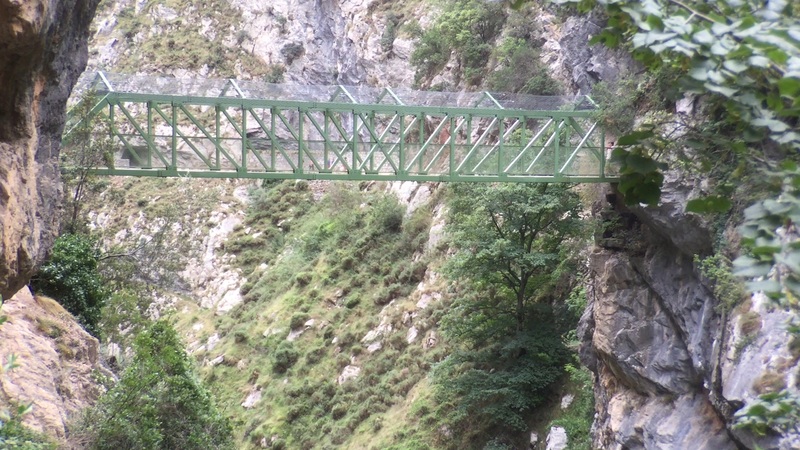 Watch the video for the most amazing scenery and landscapes on the Cares Gorge trail. Jim and Pilar run the excellent Hotel Torrecerredo in Arenas de Cabrales, Asturias, a perfect base for the Picos de Europa and Cares Gorge. It goes without saying that you should trust everything Jim says. And eat everything he cooks, because the food is brilliant too. It really is! The path itself is not too tough – pretty level all the way – but it’s a long day, especially in the heat. Fantastic views though, and one of the most extraordinary routes I’ve ever walked.